When it comes to candy, we love all kinds, but have a soft spot for any chocolate mint combo. There’s something about the indulgence of the chocolate and the refreshing coolness of the mint that gets us every time…. 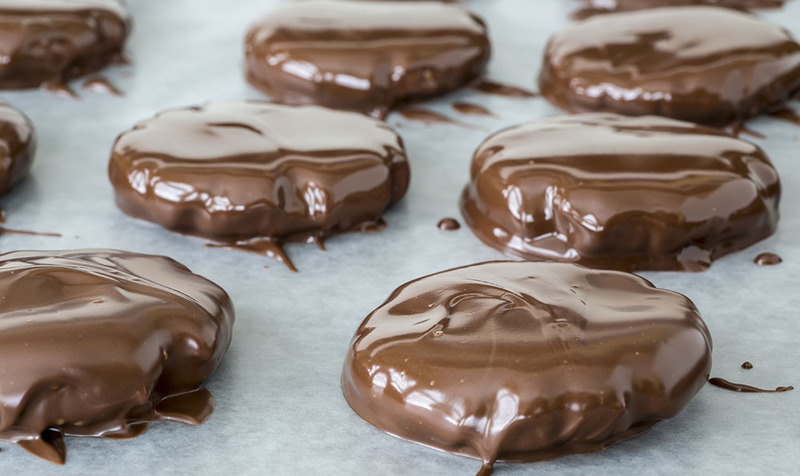 Generally, we save said minty candies for the movies, but we got a super strong craving for peppermint patties the other day and decided to make our own version of them at home – and they were great! They’re easy to make and taste even better than the ones we know and love from the store! Combine sugar, peppermint extract, butter and cream in a large bowl or mixer. Beat ingredients until creamy and smooth. About 5 minutes. Mixture will be firm, but shouldn't be sticky. If needed, gradually add more powdered sugar until no longer sticky. Transfer peppermint mixture to a piece of plastic wrap and shape it into a 1 1/2-inch wide log. Seal plastic wrap around the tube and twist the ends closed. Place log in refrigerator and chill for 35-45 minutes, or until hardened. You can place peppermint log in a cut open paper towel roll to preserve round shape, if desired. Once chilled, remove peppermint log from fridge and slice into 1/4-inch thick rounds. Place melting chocolate in a bowl and microwave at 30-second increments, stirring in between, until smooth. Use a fork or dipping tool to submerge peppermint rounds in chocolate, making sure to coat thoroughly. Let excess chocolate drip off, then place patties on parchment paper to set. Once set, serve immediately or store in an air-tight container. Enjoy!